Our eBooks are delivered by VitalSource, the industry leader. If you haven’t used VitalSource eBooks before, you’ll quickly see that they are not only easy to use but also provide all the features that you might want, including searching, highlighting, bookmarking, and adding notes. You can view VitalSource eBooks from the VitalSource website with the online version of Bookshelf. 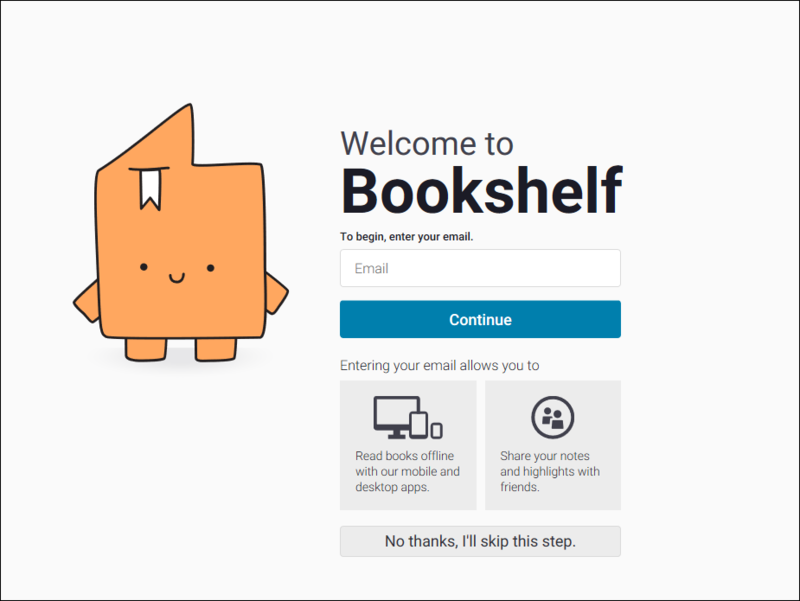 You can also install offline versions of Bookshelf on two Windows or Mac computers and two mobile devices like iPads, Android tablets, or phones. However, only one device can be active at a time. If you use the online version of Bookshelf, your eBooks expire after 365 days. If you use an offline version of Bookshelf, your eBooks don’t expire. Because VitalSource changed their API, we had to change our website to conform to that API. That in turn meant that customers who haven’t bought eBooks from us since December 6, 2018, have to re-activate their VitalSource accounts before they can get other Murach eBooks. To do that, you just need to click on the link in the email that you’ll receive if you need to re-activate. Although you can access and read your eBooks at the VitalSource website, the online version of Bookshelf simply doesn’t work the way you want it to. In particular, it doesn’t let you display facing pages so you don’t get the instructional benefits of our “paired pages” approach. Besides that, the online versions of VitalSource eBooks expire after 365 days. That’s why we recommend that you install and use Bookshelf on a Windows or Mac computer with the Page Layout set to Facing Pages. That way, you not only get the full benefit of our “paired pages” formatting, but also get all the features of Bookshelf. In fact, we believe that if you use our VitalSource eBooks in this way, they work even better than our print books. In case you missed it: When you read our VitalSource eBooks online at the VitalSource website, the eBooks expire after 365 days. However, they don’t expire if you read them with an offline version of Bookshelf. If you ordered eBooks before August 17, 2017, we fulfilled them with LockLizard eBooks, and you can still access them. A better alternative, though, is to buy the newest editions as a VitalSource eBooks. For more information, please go to Legacy support for LockLizard eBooks below. Because VitalSource changed their API, we had to change our website to conform to that API. That in turn meant that customers who haven’t bought an eBook from us since December 6, 2018, have to re-activate their VitalSource accounts when they order more Murach eBooks. If you need to re-activate your account, you will receive an email from us that provides a link to the VitalSource website. Then, you need to click on that link to go to the VitalSource website and sign in. That’s all there’s to it, and you will only have to do that once. When your order your first Murach book from VitalSouce, we will send you an email that provides a link to the VitalSource website. Then, you need to click on that link to go to the VitalSource website and activate your account. Then, if you already have a VitalSource account, you enter the email address for your account. And if you don’t have a VitalSource account, you enter the email address you want to use for your new VitalSource account. Then, after you enter your password, the online version of Bookshelf is displayed with the books that you’ve purchased in it. Then, after you register, the online version of Bookshelf is displayed with the books that you’ve purchased in it. After you’ve used Bookshelf to access your first Murach eBook or to re-activate your account, you can access any other Murach eBooks that you buy from the online version of Bookshelf at the VitalSource website or from any offline version of Bookshelf. If all of the books that you purchased aren’t shown, you can select Update Library from the Tools menu that's shown above. Then, you can use the controls at the left and bottom of the screen to work with the eBook. However, you can’t control the size of the book page, except by adjusting the size of the browser, and you can’t display facing pages. It doesn’t let you display facing pages so you can’t take advantage of our “paired pages” presentation method. The online versions of VitalSource eBooks expire after 365 days, but the offline versions don’t. 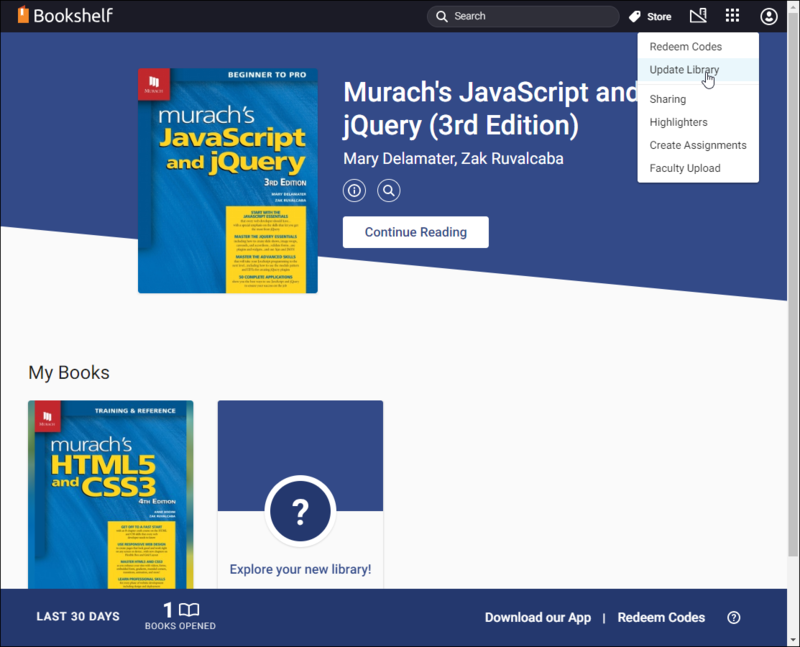 To install an offline version of Bookshelf, you start from the Home page of the online version of Bookshelf, and you click on the App toolbar button that’s shown below. Then, you click on the Download button to download the offline version of Bookshelf for the device that you’re using. If all of the books aren’t shown, you can select Update Book List from the Account menu. Then, if necessary, you can click All Titles in the Collections pane on the left side of Bookshelf. This of course is the layout that we recommend for our books because it lets you get the most from our “paired pages” presentation method. To page through the sets of paired pages when the Navigation panel is hidden, you can press the PgUp and PgDn keys. Here again, if you experiment with the controls at the top and bottom of the page, you’ll see how easy it is to search, navigate, highlight, bookmark, add notes, and more. You can download and install Bookshelf for a phone in the same way that you download and install Bookshelf for a tablet. 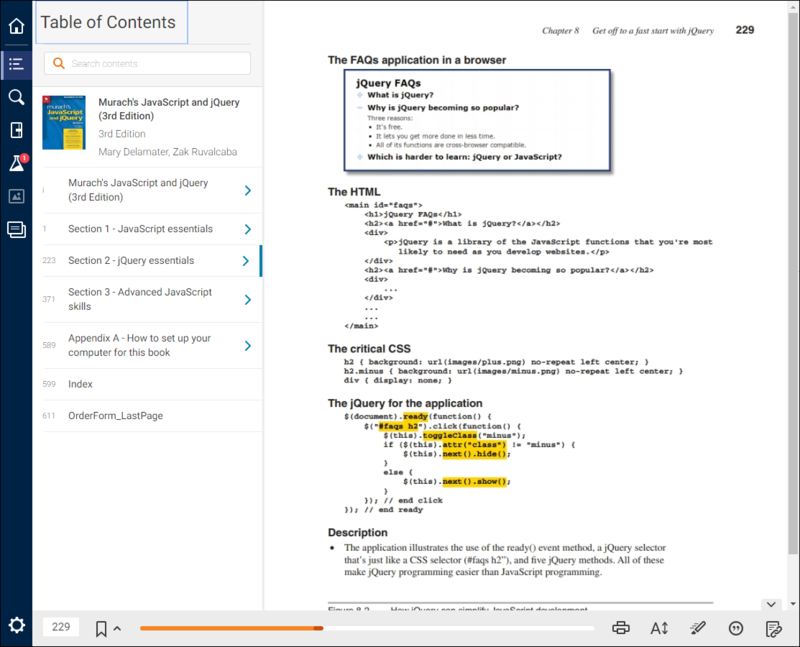 You can also open and display your eBooks in the same way. 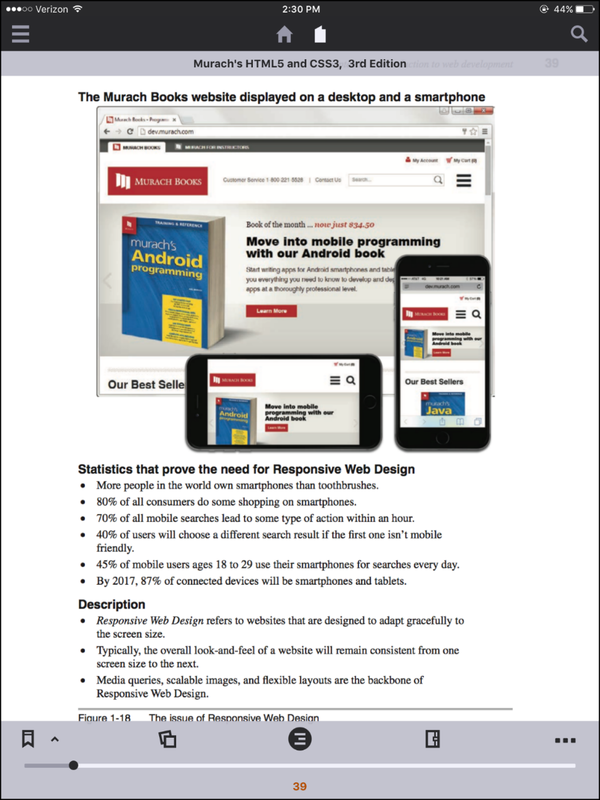 In general, though, we don’t recommend using Bookshelf on a phone because you lose the instructional benefits that you get from our “paired pages.” For some types of review, however, Bookshelf on a phone can work quite well. 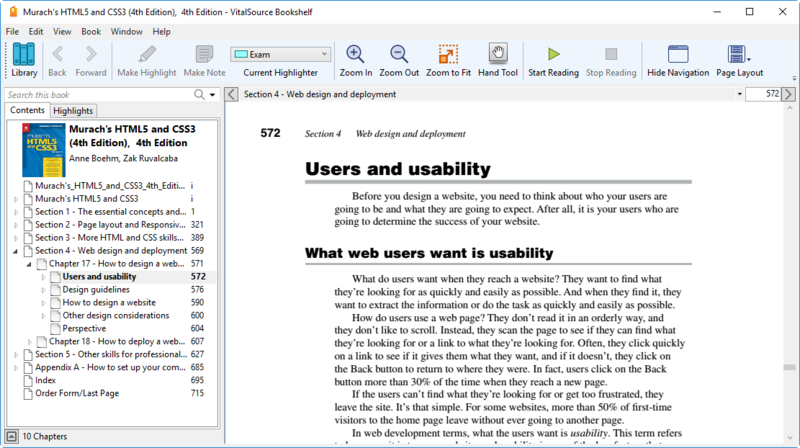 Since the offline versions of Bookshelf for Windows and Mac computers work better than the online reader, it’s worth taking the time to install an offline version. That also means you don’t have to be connected to the Internet to access your eBooks. And it means that your eBooks won’t expire after 365 days. If the device you’re using for an offline version of Bookshelf has a screen that’s large enough to support Facing Pages, use that layout when you’re reviewing our books. That will help you see how effective our “paired pages” presentation method is for technical instruction. But remember that Facing Pages are only supported by the offline versions of Bookshelf for Windows and Macs. On tablets, you can’t display both pages in a pair, but you can display one full page at a time. Just remember that each text page in our books is matched with a facing figure page. As a result, you can switch back and forth between text and figure just by going back and forth between pages. 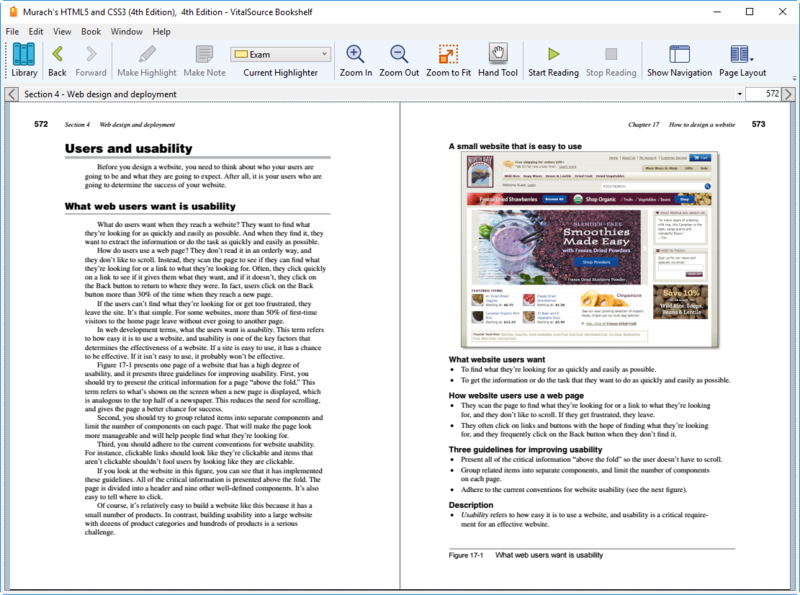 On August 17, 2017, we switched from LockLizard eBooks to VitalSource eBooks. If you bought LockLizard eBooks from us before that date, you will still be able to download your eBooks by opening the orders on your My Account page on our website. You will also be able to access the file that you need for registering LockLizard Viewers on your devices. A better alternative, though, is to buy the latest edition of the book as a VitalSource eBook. That way, you’ll get all of the benefits that VitalSource eBooks offer. Download and install the LockLizard Viewer for the device. Download the eBook and open it in the Viewer. Go to your My Account page on our Retail web site. Click on the “Legacy eBook Instructions” tab. Follow the instructions in that tab. 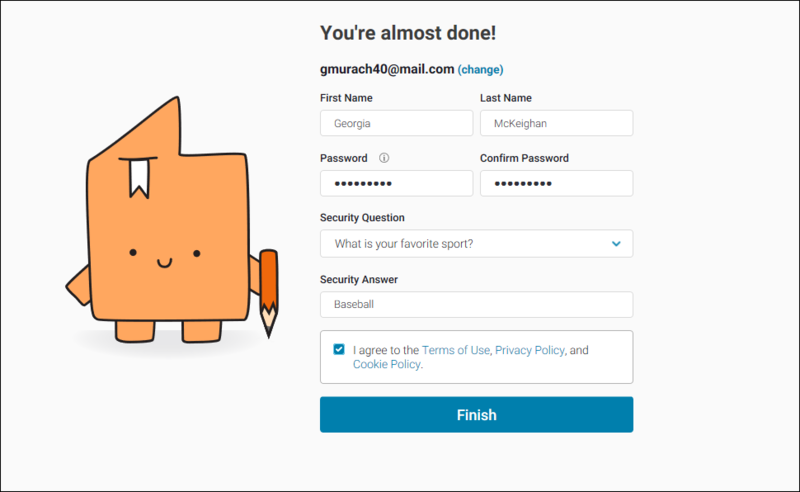 Go to your MyAccount page on our website. Open the invoice for the LockLizard purchase and click on the Download Now button for the book. Please download our LockLizard eBooks PDF.